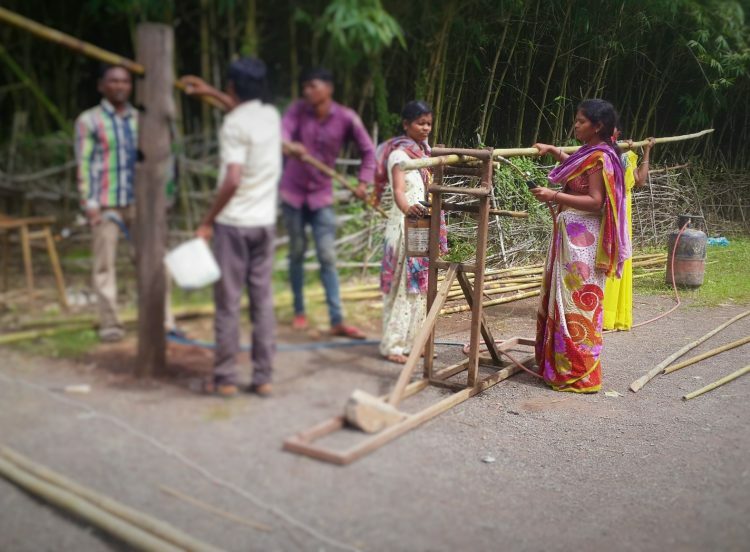 This is the first installment in a four-part series focusing on women’s involvement in the bamboo sector in India. Giraben, a bamboo entrepreneur from the state of Gujarat in India, helps us understand the impact of bamboo on her life in the interview below. She is from Patharda village in Tapi district of Gujarat State and is a full-time artisan with the Centre for Indian Bamboo Resource and Technology (CIBART). Along with other women and tribal community members, she has gained new employment through the ‘Bamboo livelihoods business enterprise project’ funded by the Development Support Agency of Gujarat, under the Tribal Development Department of the Government of Gujarat. The project is implemented by CIBART with INBAR acting as a technical partner. The project has led to a dramatic rise in Giraben’s household income, as well as other gains. The average increase of household income for all project beneficiaries is around 150 per cent. In addition to income and livelihood benefits, diversification of farming systems to include bamboo is also helping to protect and conserve soil and water resources, increasing communities’ resilience to climate change. Can you tell us little bit about yourself? 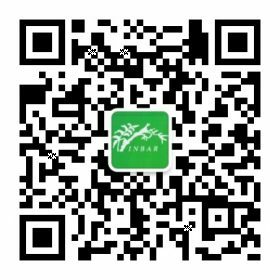 I am Giraben and I have worked with CIBART in Ukai village since 2010. I am 30 years old and belong to Kotwalia, one of the primitive tribal groups in the southern part of Gujarat State. I live in Patharda village in Songadh Taluk, Tapi district. Before joining CIBART, I was a home maker and my husband was a wage labourer on a construction site. I stay in a joint family set-up and at home I used to engage in making bamboo baskets during leisure time, as basket weaving is a traditional livelihood for many Kotwalia families even today. What was your role in this programme and what did you learn? I joined as a trainee six years back with CIBART in their ‘Bamboo Livelihoods Business Enterprise Project’, which was operational in three districts: Tapi, Navasari and Dangs in South Gujarat. After four months’ intensive training on bamboo furniture making, I was inducted as one of the employees in Ukai’s workshop Unit in July 2010. I learned the skills required for making furniture: making slats, joining, assembling, polishing and finishing. How do you apply the skills obtained from the programme now? I still work as an employee here in the Ukai Unit and am an important team member in the Trainer Pool too. I am part of a furniture making group in the workshop and tasks are shared within the group members. All members are from the same community and peer sharing helps in achieving better work output and supports general improvement over time. My husband and I work together and we have played an integral role in the new furniture designs through our suggestions and support. Looking back at the beginning and end of this programme, how did it change or impact your life/ livelihood? We belong to a basket weaving community. However, we did not have knowledge on making furniture products until we joined CIBART. The newer skills acquired through training and working here help us to earn a stable income on monthly basis. Kotwalia community members are poor and hence there used to be a divide between Kotwalia and other communities in the village where we reside. This financial gap started filling gradually and through these six years of working, we have not just earned income and but also gained respect. Now, not only our community members but other communities too have approached my husband and me for our advice on social matters, and we get invitations to social functions, festivals, cultural events and marriages. How did it affect your income and/or the average income of your family? In the past, my husband worked as a construction site labourer and was engaged on an average four days in a week with a daily wage of INR 100 (approx. USD1.5). Our whole family engaged in making 30 baskets per week that fetched us a weekly income of INR 1000 (approx. USD15). Some months the basket weaving work was not productive, as it is time-consuming work to fetch bamboo from the forest/ mandi and weaving it into different sizes of baskets. This tiresome task led most of the community to seek alternative livelihoods and the head of the family, my husband, took the wage labouring job. Now both of us get a regular monthly salary and additional income when we achieve targets. Earlier all of us, including our family members, earn a maximum of INR 5500 (approx. USD82) and led a life full of compromises. What did you do with the additional income? Our group makes products quickly and we receive additional income when the target production is completed. Income earned is spent on children’s education, to buy food and groceries, on gifts for our loved ones’ marriages, on family get-togethers – we never could afford spending money on these activities in the past. We go to films and invested in a vehicle, we bought a TV, gold jewellery – mangal sutra [traditional ornament worn by many married women in India] and many useful household articles. We are planning to make our own pukka house [cemented/permanent housing] soon from the additional income. What type of programme activities were the most use and meaningful for you and why? Skills enhancement to artisans is the most use and meaningful part of this project, I feel. In Gujarat, the Kotwalia community has the skillset for basket weaving. However, the community artisans received intensive inputs on bamboo furniture making, bamboo structures making and through the enhanced skills, we receive better wages and regular income. Another part we feel is about the working facility and the working discipline and we learn a lot about working in a group, behavioural aspects, government schemes, health issues etc. which I feel will be useful to us always. Are there other positive benefits and challenges that you encountered through this programme? There are positive benefits and socially I am an empowered person now. In the recent local government elections, I contested for a member position and won in the election. I am a proud member of the Local Government. We stay in a kuccha [housing structures that use mud instead of cement, bricks etc.] house and there is a plan for a pukka house on the cards. We have gained confidence that we can manage the financial expenses well. Earlier we never thought about investment; however we have now invested in a two-wheeler (vehicle), which helps in reaching the workshop in time and thus ensuring that I can always cook food for my children. Both of us receive appreciation and respect among our community members. Our children are going to school and I have an ambition to send my daughter for nursing studies and for my son to become a policeman, which will soon come true . What type of livelihood did/does the project support? The project supports a sustainable livelihood utilising bamboo and ensures that I earn regular income through my continued employment with the production unit. How do you see yourself in the future of the bamboo and rattan sector? With enhanced skills on products making, in the future myself and my husband are planning to set up an enterprise, focusing on bamboo furniture and utility products in our village, and become an entrepreneur full time. What do you know and think about bamboo and the environment? Earlier I was ignorant about the uses of bamboo and I am now working with this material every day and feel extremely proud. Bamboo is an environmentally friendly plant and helps with green cover, as well as for biomass and firewood and in making products and building strong structures. Do you grow bamboo at homestead or in farm? Yes, I had planted two bamboo plants in our backyard some years ago and they have grown big now. We Kotwalia community members do not own land and we live in the place allotted to us by the local government and through the project, we have received these plants and planted them for our personal use. “The uncertainty of work and income is behind us and now because of bamboo we have a more stable financial position and societal respect”. In additional comments, Giraben and her husband confirmed are very satisfied with CIBART. This satisfaction does not just stem from financial improvements alone, but also the work stability and respect earned in the society. They were appreciative of the work culture at CIBART and said that “The organization has a good working discipline”. Bamboo has now become a core part of their lives and their increased contributions in designing the products in the projects reflect their ability to become owners of an enterprise in future. The Centre for Indian Bamboo Resource and Technology (CIBART) is a non-governmental organisation set up by INBAR through its work with IFAD, which has gone on to become a highly successful national partner in India implementing action research on bamboo livelihood development in several states across India.